Our Virtual Reality Room (room 114 on level one) is a pilot project for our campus community to explore ideas, data, content and places in new and astonishing ways. The room is designed to provide access to an immersive, real-time virtual experience for users with no prior experience or training using this technology. Virtual reality can be used to play games, view films in 360°, visualize data, interact with 3D models of objects that may be too microscopic or fragile to handle in real life, and visit places around the globe and even fictional or impossible worlds. The Oculus Rift headset was designed to be easy and comfortable to use. It completely covers the user’s eyes, immersing them in a digitally created environment with accompanying audio through headphones. Some applications also allow you to use the Oculus Touch controllers to manipulate objects in the virtual world. One user at a time can interact with content in 360 degrees, while others can watch and trade off. Students, faculty, and staff can reserve the Virtual Reality Room for three hours at a time and pick up the key and controllers at the Information Center Checkout Desk. View the Virtual Reality Room's full policy. 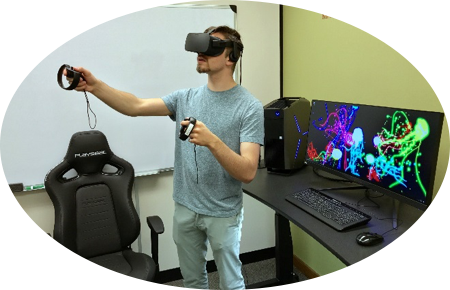 We welcome University of Montana faculty, students, and employees to explore the use of virtual reality in their academic and personal lives. 3D Organon VR Anatomy is the world’s first fully-featured VR anatomy atlas. Explore 15 body systems with more than 4000 realistic anatomical structures and organs. You can select, hide, and fade bones, muscles, vessels, organs and other structures. Zoom in and examine them closely from all angles, read or hear anatomical terminology and study descriptive texts. Multiplayer action shooter program based in the American West. With Earth VR, you can fly over a city, stand at the top of the highest peaks, and even soar into space. Bring peace, joy, and calm back into your daily life with this simple and visual meditation app. This VR experience features 27 environments and over 500 meditation spots. In a world where robots have replaced all human jobs, step into the "Job Simulator" to learn what it was like 'to do the job'. Players can simulate the ins and outs of being a gourmet chef, an office worker, a convenience store clerk, and more. In Lone Echo's single player story, you'll be transported to an advanced mining facility within the rings of Saturn, complete with a detailed space station, expansive outer-space environments, and interactive space equipment. Use futuristic tools, clever problem solving, and interactive dialogue to engage with the world around you. Lucky’s Tale is a delightful platforming adventure game designed exclusively for the Oculus Rift. As you walk beside the lake on a cloudy night, a curious, organic artifact falls from the sky and transports you across the universe. The worlds of Obduction reveal their secrets only as you explore, coax, and consider them. The official 360 Photos app from Oculus will take you on a tour of amazing sights from around the world. First Contact is an official Oculus experience designed to be a introduction to Oculus Touch. Experience the magic of ‘presence’ in VR. Features include a magic box full of toys and a robot guide; make a new friend, then touch, tap, bounce, hold and throw things, and play together. Medium is an immersive VR experience that lets you sculpt, model, paint, and create tangible objects in a VR environment.Oculus Medium uses Touch controllers to enable authentic hand gestures and movement for a natural, tactile experience. Includes a tutorial system. Study shape and form, then iterate quickly to find creative solutions. Use 300 prefabricated stamps—and even make your own—to build complex structures in minutes. Export high-res meshes for 3D modeling and printing, or use them your favorite game engine. The official Video app from Oculus. Watch Facebook 360 videos, Twitch, Vimeo, and your own movie files in a completely new and immersive way. You can choose from multiple VR theater environments including in a home theater, on a phone in the forest, and even the surface of the moon. Quill is the VR illustration tool built to empower artists and creators, whether to create final art or as a production tool for concept creation aid. Enter a futuristic gladiatorial arena packed with rabid fans as you face off against networked opponents in a disc throwing duel. A wholly unique navigation system will allow you to deftly position your hover board as you reach out with your Touch controllers to launch, catch and punch the speeding, spinning Ripcoil disc. Robo Recall is an action-packed VR first-person shooter with visceral Touch gameplay and an in-depth scoring system. Explore our Solar System, view constellations and meteor showers in your night sky, explore Mars with the Curiosity Rover, and hold planets, moons, asteroids and even stars in palm of your hand. Users can install applications from their personal accounts for the duration of their reservation. The ultimate entertainment platform. Play, connect, create, and more. Log in to your personal Steam account and download your own games to play using our high-speed internet for your entire checkout session! This simulation is based on a premise that most of the autistic people suffering from multitude of autistic spectrums are easily distracted by elements and inputs in the world around that a normal person filters automatically. Scale huge heights and feel the exhilaration of extreme free solo climbing. Explore and enjoy the view or compete for the fastest times on leaderboards with Touch or gamepad controls. This is one of the best ways to showcase the power of social interaction in VR. Light fireworks, drive tanks in zero gravity, and interact with a variety of gadgets and games with a friend—wherever they are. Virtual Desktop is an application that lets you use your computer in VR. You can browse the web, watch movies, Netflix or even play games on a giant virtual screen. With Touch controllers you can interact with your computer seamlessly.